A Santa Maria man crossed San Luis Obispo County south to north Sunday morning after stealing a car and holding a father and son hostage. The man then stopped in Atascadero to commit a robbery before driving to San Miguel with sheriff’s deputies on his tail. 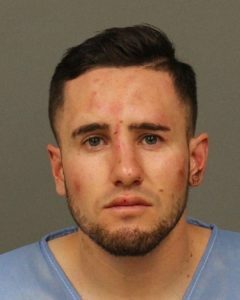 After entering the victims’ car in Santa Maria, Baltazar Alverez Mendoza, 26, held the father at gunpoint and forced him to drive northbound on Highway 101, according to the Atascadero Police Department. In Atascadero, he stopped at a Shell station located at 9155 San Gabriel Road. Around 9:45 a.m., while wielding a gun, Mendoza robbed the gas station. During the robbery, the carjacking victims escaped and called 911. Police received the carjacking victims’ 911 call shortly after receiving a report about the robbery. Mendoza fled in the victims’ car but was quickly located by a San Luis Obispo County sheriff’s deputy. The suspect continued to flee, and deputies chased him to San Miguel, where the pursuit ended with a traffic collision. Officers arrested Mendoza on charges of robbery and kidnapping and booked him in San Luis Obispo County Jail. Other charges are pending. Mendoza remains in custody with his bail set at $500,000. His initials are BM. Appropriate. There are some people who need to be removed from all possible contact with other humans. Not to worry, thanks to Governor Brown Mr. Mendoza will be out very soon and likely take another road trip.